Comedy night with Andy Kind! Andy has been a professional comedian for 14 years and has filled venues up and down the land with his story-telling brand of humour. He has been featured on BBC1, ITV, Channel 4 and supported Tim Vine on tour dates. Andy has a desire to not just tickle funny bones, but also speak life to dry bones. HIPS is an attempt to do that. Join us for an evening with Andy as he explores the theme of life and meaning through stories and jokes. 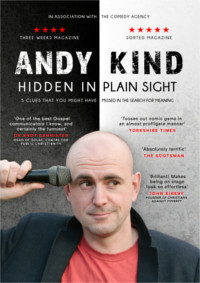 Although Andy's jokes are clean and suitable for a church this event is for people aged 14+. The performance will be in two halves, with refreshments being served in the interval.